Construction of Stadio Armando Picchi started in 1933 and soon after a first match was played at the still unfinished ground. The stadium officially opened more than a year later in March 1935 with an international match between the B-sides of Italy and Austria (0-0). The stadium was initially called Stadio Edda Ciano Mussolini, and was renamed Yankee Stadium for a short period after the Second World War when it was used by the Americans. Stadio Armando Picchi has hardly changed since. Only in the mid 2000s some small renovations got performed so that the stadium would comply with league requirements. 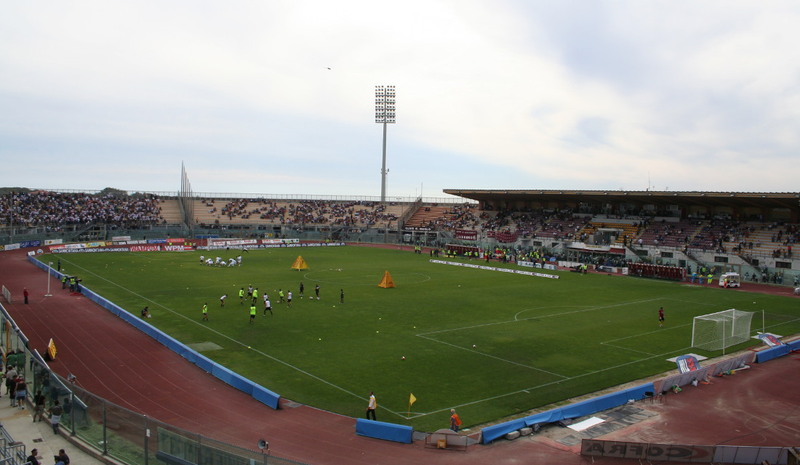 Stadio Armando Picchi is located in the south of the city of Livorno at only a few hundred metres from the Mediterranean coast. It lies about 3 kilometres from Livorno’s historic centre, and just over 4 kilometres from the city’s railway station, which lies further east. Get bus 1 from the railway station or city centre. Get off at Barriera Margherita or Viale Italia, San Leopoldo. The journey from the centre takes only 10 minutes, and that from the station 10 minutes more. An alternative from the centre is line 5 (e.g. from the Via del Porticciolo). The bus passes right by the stadium. Get off at Via dei Pensieri Stadio. The journey takes about 15 minutes. Tickets for Livorno matches can be bought online via Bookingshow.it, in person at the club store at Stadio Armando Picchi, or at one of the Booking Show sales outlets. These sales outlets include the Chiosco Livorno at shopping centre Fonti del Corallo right at the back of the railway station, and Ricevitoria TotoTerzo at Piazza Mazzini just south of Livorno’s historic centre. Tickets typically start at €10.00 for a seat at the curve, and range from €15.00 to €60.00 for a seat at one of the sides. You can find a seating plan here. For more information email biglietteria@livornocalcio.it. Livornocalcio.it – Official website of Livorno Calcio. Comune.livorno.it – Official tourism website of the city of Livorno. Atl.livorno.it – Livorno public transport information.